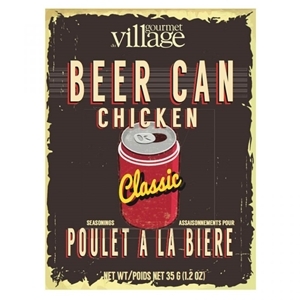 Gourmet du Village Classic Beer Can Chicken Seasoning is a great way to get that moist, seasoned chicken, you'll never want to cook a chicken any other way. For a wonderful recipe, simply rub the chicken inside & out with our seasoning and add the remaining seasoning to the beer. This can be used to flavor your chicken no matter how you cook it, on the BBQ or in the oven. Combine seasoning mix with olive oil in a small bowl. Rub the chicken with the seasoning and oil mix, including under the skin, where you can lift it with your fingers. Open can of beer and pour half into a glass for yourself. Combine remaining seasoning with ketchup and pour into the can half full of beer. Place beer can in roaster then place chicken on top. Preheat grill. Place bird on grill. Grill over indirect medium heat for 1 1/2 hrs until internal temperature of thigh is 180 degrees. Remove chicken when finished cooking & let sit for 10 minutes before carving. Sea salt, spices, onion, mustard.